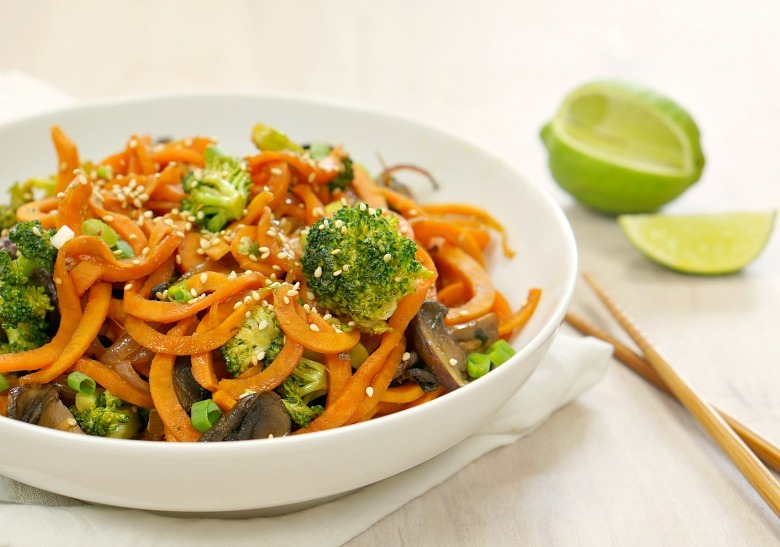 Fresh veggies take center stage with this sweet potato zoodle stirfry! 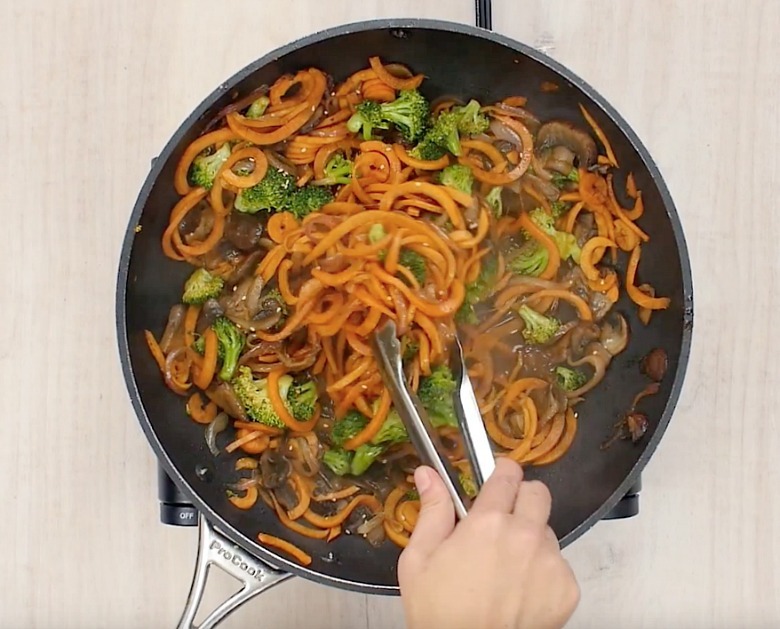 No guilt and plenty of flavor will make this zoodle recipe a go-to weeknight dinner. As cooler weather sets in, I find myself cooking inside a lot more often. 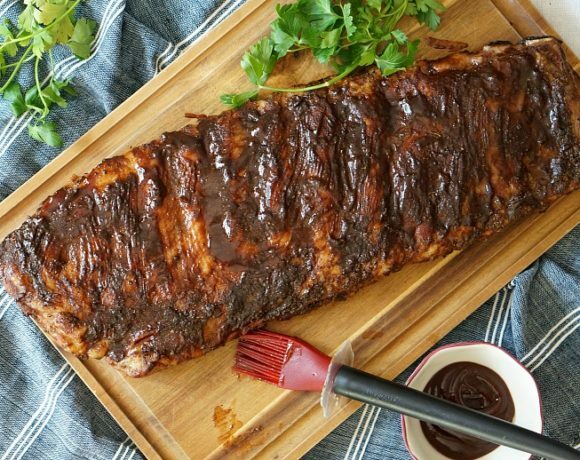 Bygone are the days of throwing whatever I have in the fridge onto the grill. I actually have to think about what we’re going to have for dinner. On the plus side, I’ve busted out the zoodler again. Man, I forgot how much I love veggie noodles! 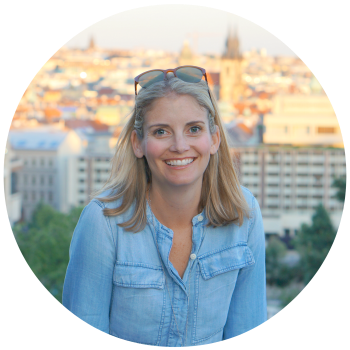 I’ve shared plenty of zucchini noodle recipes on Forks and Folly, as you can see here. But as I was spiralizing sweet potatoes the other evening, I realized it was high time I shared this Sweet Potato Zoodle Stirfry recipe. 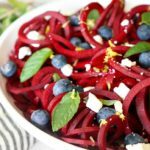 Sweet potatoes are super easy to spiralize with the right tool. 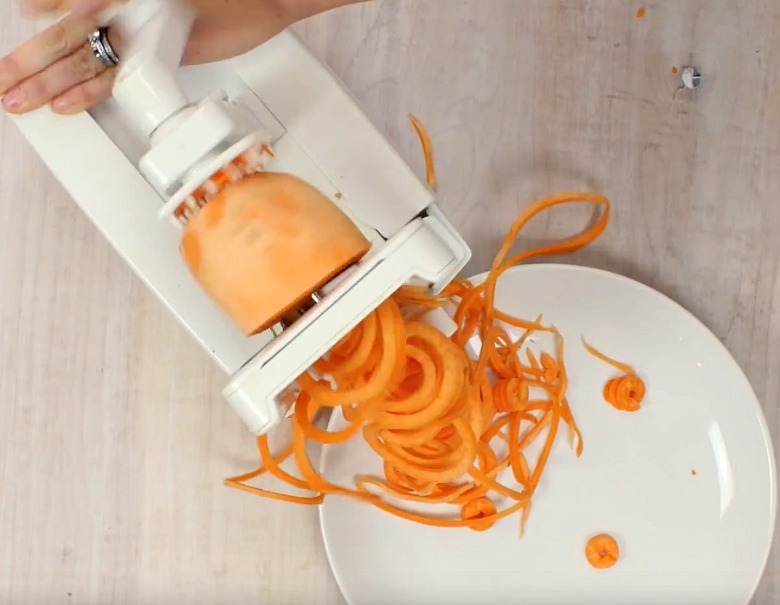 I luh-ove my Paderno spiralizer, which is one of my favorite Christmas gifts ever received. (Thanks Angie-poo.) 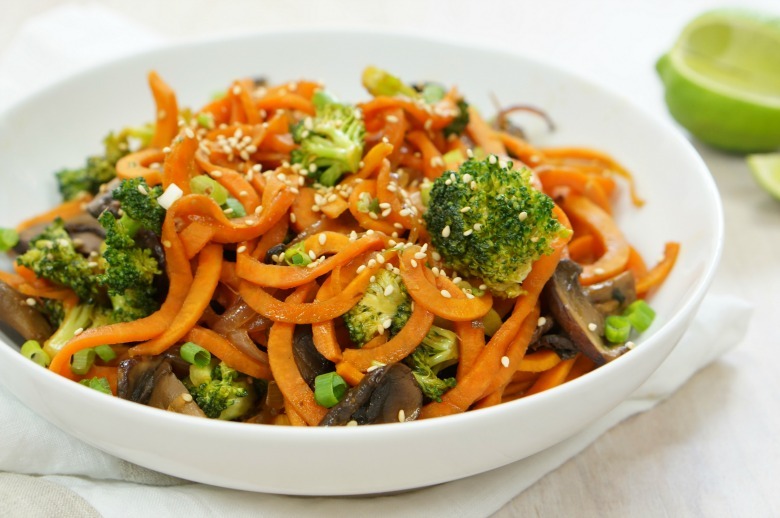 And when tossed with fresh veggie and an easy-to-make sauce you’ll have no trouble getting the kids to eat their veggies! 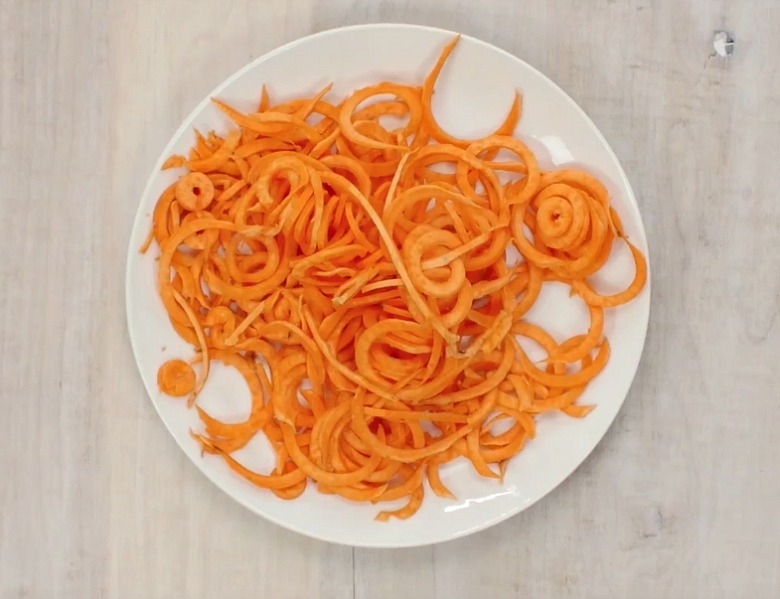 Peel the sweet potatoes and run them through your spiralizer on the coarse noodle setting and set aside. Heat a wok over high heat. 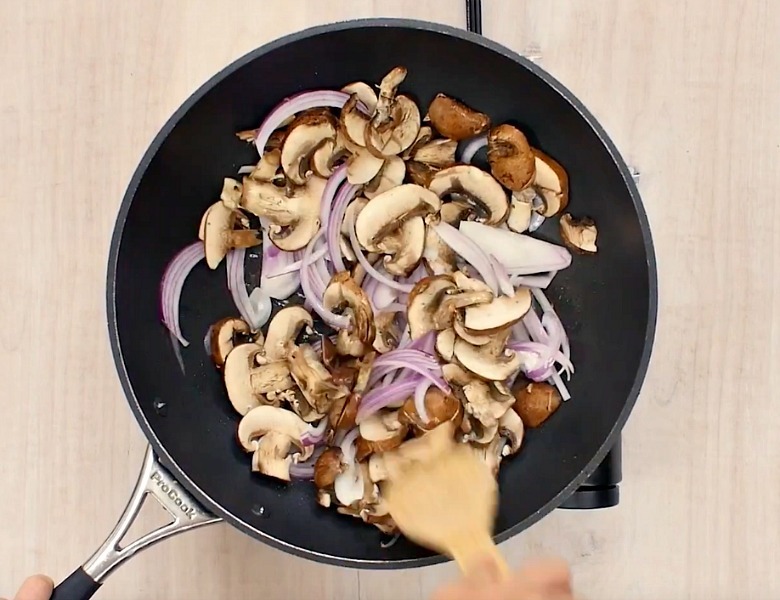 Add in the vegetable oil and once super-hot toss in the sliced onions and mushrooms. Toss and cook for 3-4 minutes until softened and browned in spots. Add the garlic and cook another 30 seconds, until fragrant. Now it’s time to add the zoodles, broccoli, hoisin sauce, soy sauce, sesame oil and ginger paste. 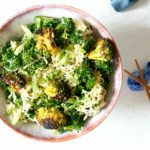 Toss to coat and allow to cook until the broccoli is bright green, the noodles are bite-tender, and the flavors have melded together, about another 3-4 minutes! 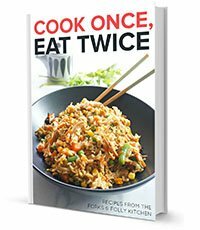 Serve the zoodles in individual bowls, garnished with sesame seeds, scallions and a lime wedge. Enjoy! Now it's time to add the zoodles, broccoli, hoisin sauce, soy sauce, sesame oil and ginger paste. 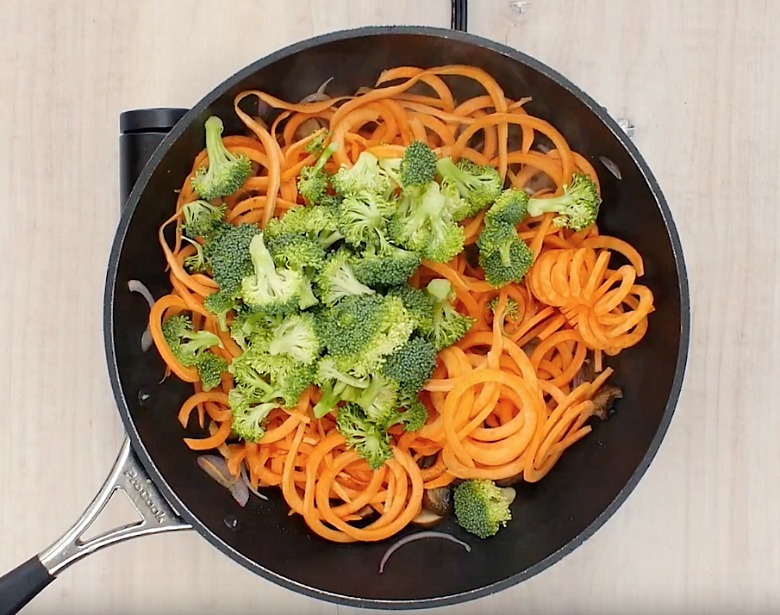 Toss to coat and allow to cook until the broccoli is bright green, the noodles are bite-tender, and the flavors have melded together, about another 3-4 minutes! Serve the zoodles in individual bowls, garnished with sesame seeds, scallions and a lime wedge. 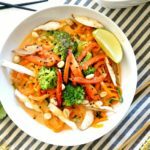 In the mood for other Asian cuisine? 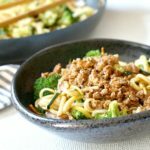 Check out our Easy Banh Mi Style Pork Tacos recipe or our recipe for Hibachi-Style Ginger Zucchini! Previous Post: « Maple Bacon Pancakes. Maple. Bacon. Very creative! 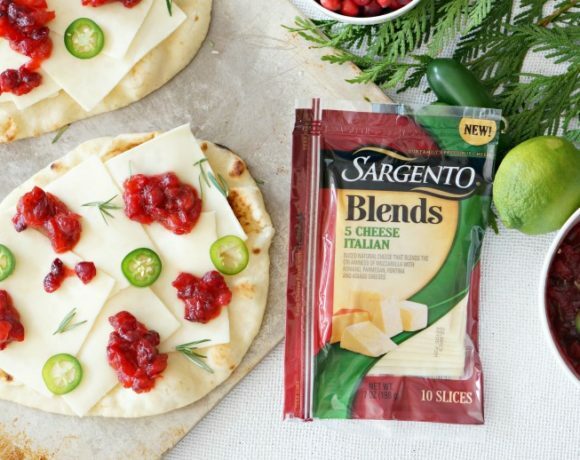 The flavor combinations sound delicious!